Should Progressives Prioritize the Defeat of Newsom? On May 11th, Supervisor Chris Daly sent out a “save-the-date” e-mail to progressive allies for a Mayoral Convention on Saturday, June 2nd – calling it “the most important progressive gathering of the year.” At the Convention, progressives will “consolidate our platform, train in the nuts and bolts of electioneering, launch our candidate(s) for Mayor of San Francisco, and have lots of fun!” With no serious candidate ready to challenge Gavin Newsom this November, many will say that this Convention is long overdue. But aside from practical concerns – pulling off a convention on such short notice – should progressives prioritize the defeat of Newsom? First, Supervisors have shown in the past year that they have the power and initiative to get things done, even with a Mayor resistant to change. 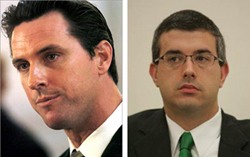 Second, Newsom’s hands-off role as Mayor has made him a less formidable foe than Willie Brown. Third, Newsom has sometimes been willing to champion progressive causes – if he can take the credit. While it is obvious that voters deserve a choice this November, the truth is that nobody really wants to run. Which raises the question – why not just let Gavin be the ineffectual lame-duck Mayor that he is for the next four years? As is the case in most places, the Left in San Francisco is notoriously fractured with personal egos and backroom deals dominating what should be an issue-based agenda. If you believe that there should be a candidate for Mayor, Chris Daly deserves credit for suggesting that progressives throw a grassroots nominating convention to pick the candidate. The process should be opened up to everyday activists, and the candidate chosen be the one who has the largest base of supporters. In the 1970’s and 80’s, Berkeley progressives recruited their City Council candidates through a convention process – and pro-tenant activists still pick their Rent Board candidates that way. In 2000, I ran for the Berkeley Rent Board because I was selected by a progressive nominating convention. I am well familiar with the convention process, and am a firm believer in its potential. But in Berkeley, progressives threw these conventions when multiple people wanted to run – and the purpose was to unify the Left behind a slate of candidates. While many San Francisco progressives want to see Newsom challenged this November, no high-profile candidate is itching to make it a race. Rather than decide among a crop of eager candidates, the June 2nd Convention appears to be more about drafting an alternative. On the other hand, in 2002 Berkeley progressives were likewise frustrated because nobody wanted to run for Mayor against Shirley Dean. I was part of a group that set up a Nominating Convention, which was instrumental in getting former Assemblyman Tom Bates to enter the race. The Convention was a success because we built up a grassroots base to persuade a high-profile candidate to run, and we all celebrated a victory six months later. If the June 2nd Convention convinced a giant like John Burton to run for Mayor, that would be a success. But Burton, Mark Leno and others have already endorsed Newsom for re-election and so will not agree to be drafted. If there’s going to be a candidate who will come out of this Convention, it will likely be Matt Gonzalez, Ross Mirkarimi or Daly himself – in other words, a candidate who is the serious underdog and would probably not be running to win. Which raises the question: should progressives even run against Newsom? Are things so bad now that a mayoral challenge – even one that has little chance of prevailing – would be worth the trouble? In 1999, Tom Ammiano ran a long-shot campaign against Willie Brown, despite little chance of winning and Mayor Brown’s well-deserved reputation for being vindictive to his opponents after victory. But it was the right thing to do because the dot-com boom was driving renters out of the City, the Mayor was aggressively imposing his agenda and the Board of Supervisors was acting like rubber-stamp. But today, as many have reported, it is the Board of Supervisors – not the Mayor – who is leading the charge on policy measures and aggressively framing the City’s agenda. And in recent months, we have seen that the Board has the political ability to get things done, with or without the Mayor’s support. Before the November 2006 election, every one of the Mayor’s vetoes were sustained by a 7-4 vote – from Healthy Saturdays to C-3 Parking Legislation to pro-tenant measures. But starting with the vote on police foot patrols, the Board began to override the Mayor’s vetoes with an 8-3 super-majority that has remained steady for the last six months. Newsom’s latest veto of the $28 million affordable housing supplemental (issued at 5:00 p.m. last Friday) will probably be overruled as well because the Board initially approved it by an 8-3 vote. Meanwhile, Newsom’s Wi-Fi proposal – which will be heard at the Board’s Budget Committee today – is likely dead on arrival, as the Supervisors just need six votes to kill it from going into effect. If we’re talking about getting substantive policy accomplishments with a new Mayor, how is Newsom preventing the progressive agenda from going into effect? And even in places where the Mayor has a built-in advantage, he can’t even keep his own ducks in a row. The seven-member Police Commission has four Mayoral appointees, and three by the Board of Supervisors. But on May 9th, the Commission elected transgender activist Theresa Sparks as its President by a 4-3 vote – when Mayoral appointee Joe Alioto-Veronese crossed “party lines” to support her. Despite intense lobbying from the Mayor’s Office to elect his candidate (Joe Marshall), Newsom couldn’t even get all his appointees on the Police Commission to listen to him. Whereas Newsom is a hands-off Mayor who governs by press release, Willie Brown would have certainly never allowed such a situation from happening. If anything, progressives are blessed to have a moderate Mayor who is so incapable of putting up a fight when he chooses to do so. While Newsom has had fights with the Board of Supervisors, he has proven to support progressive causes – if allowed to take credit. In the past year, San Francisco has earned well-deserved praise for being the first large city to implement a universal health care initiative. Everyone on the inside knows that it was Tom Ammiano who did the work, but Newsom has reaped the benefit for having supported it. But Ammiano allowed Newsom to take credit for the Health Care initiative, because it mattered to him more that it get done than scoring political points. As a result, the Mayor and the Board unanimously approved what was last year’s most ambitious legislative accomplishment. Progressives who want to see Newsom challenged are upset that he has received so much credit, but it shows that the Mayor can be pushed to do the right thing. Now the Mayor has made noise about supporting a gross receipts tax, Free Muni and community choice aggregation – all progressive initiatives that the Mayor’s business allies are likely to oppose. Do progressives want to focus over the next six months on fighting the Mayor’s re-election, or work with him to get these things done even if he unfairly gets too much credit? While it looks like the June 2nd Convention will select a candidate to challenge Mayor Newsom in November, progressives should consider what part of their issue-based agenda is really getting stalled. It’s frustrating to have a Mayor who won’t even attend Question Time after the voters approved it, but the real question is whether progressives are better off letting Newsom be a lame duck for the next five years – than awakening a vindictive Mayor who would be more formidable after his re-election. And getting good laws passed – regardless of who gets elected – is what should really drive us to be involved in politics.